12-местный лайнер Fokker F.10 обычной для фирмы "Fokker" трехмоторной конфигурации с высокорасположенным крылом построили на заводе "Atlantic Aircraft" в Нью-Джерси в 1927 году. Тогда же был развернут ограниченный серийный выпуск для различных американских ДальшеMore>>> авиакомпаний. За F.10 последовал усовершенствованный 14-местный вариант F.10A. Эта переделанная модель оказалась очень популярной и широко использовалась авиакомпаниями США. Лайнер, названный Super Trimotor, имел увеличенный фюзеляж и усовершенствованное крыло, но сохранил компоновку кабины экипажа предыдущей версии. ONE of the several types of Fokker commercial aircraft constructed at the Hasbrouck Heights (N.J.) factory of the Atlantic Aircraft Corporation (a subsidiary of the Fokker Aircraft Corporation of America) is the "F-10." Three of these were ordered some time back by the Western Air Express Co. It is of interest to note that these three machines were ordered under an equipment loan granted to the Western Air Express by the Guggenheim Fund for the development of a model airway between Los Angeles and San Francisco. Construction of the machines was not commenced until after Maj. C. C. Mosley, operations chief of Western Air Express, had returned from a tour of the principal European air lines. Final specifications were then drawn up and construction started - the first machine being completed, we understand, in a record time of practically three months. The "F-10," which is fitted with three 400 h.p. 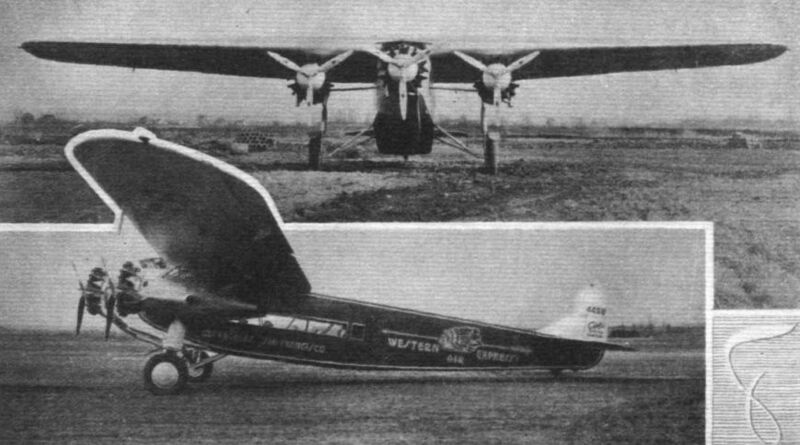 Pratt and Whitney "Wasp" engines, follows Fokker practice, having a full cantilever wing of wooden construction, and steel tube fuselage. It has accommodation for 12 passengers and approximately 480 lbs. of mail or freight - in addition to two pilots, fuel, oil and accessories. With a gross weight of 11,500 lbs. it has a disposable weight of 4,950 lbs. of which 2,640 lbs. is pay load. The top speed, full load, on three engines, is 148 m.p.h. and on two engines, 122 m.p.h. The fuselage is constructed entirely of welded seamless steel tubing, of 10225 carbon steel, the tubes being oxyacetylene welded with all members meeting concentrically. At critical points - where concentrated loading occurs, or where a number of tubes meet - joints are reinforced by pieces of sheet metal welded to the sides of the tubes. From the nose to the rear of the cabin the fuselage is built up in the form of a Warren truss, thence to the tail it is wire braced, with double piano wire looped through a tubular angle piece in the corner of the joint. With this arrangement the passengers' cabin is entirely free of bracing. In the nose of the fuselage, immediately behind the central engine, is the pilots' cockpit, which is large and roomy. 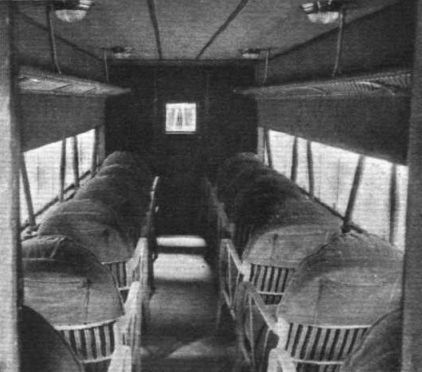 The seats are located high up with a space between them, and beneath the flooring of the cockpit - which consists of corrugated duralumin on steel tube supports - is a compartment for wireless or additional luggage. Entrance to the cockpit is gained by way of a door on the right-hand side of the fuselage, while there is also a door at the rear leading into the passengers' cabin. The pilot's control is rather interesting. Between the two seats is a single control column, hinged in the middle so that the top half may be swung over opposite either seat. It is fitted with a wheel control operating through cables which pass over pulleys at the hinge. When the hinged portion of the column is swung over to the side required, the hinge is locked, and the column operates as one. For rudder control, dual pedals are provided. Under normal conditions the machine is controlled from the left-hand seat - which, by the way, is adjustable – and for this reason all the main instruments are located on that side of the dash. The engine controls are grouped together below the centre of the instrument board. The wing engines have their instruments mounted on small panels on the inner side of the engine nacelles, below the wing, lights being provided on these panels so that the instruments may be seen at night. The cowling of the cockpit fairs into the wing and is provided with flat, sliding, safety glass sides and roof. Excellent vision is thus obtained forward, sideways and upward. From the cockpit to a point just aft of the wings the fuselage is formed into a large cabin, 16 ft. long, 5 ft. wide, and 6 ft. high. 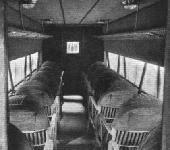 The 12 seats, of wicker construction heavily upholstered with grey velour, are arranged six on each side, and above each row, near the ceiling, is a narrow rack for small baggage, while in the back of each seat is a pocket for papers and such like articles. Safety glass windows, mounted in frames so that they can slide longitudinally, extend the full length of the cabin, which with four dome lights in the ceiling, make the cabin light and cheerful both by day and by night. The whole of the cabin is elaborately fitted up, all fittings being nickel plated, and for use in cold weather an exhaust heater is connected to the cabin from the centre engine, while the walls, ceiling and floor of the cabin are padded with Balsam wood - which not only provides insulation against extreme outside temperatures, but also serves to deaden the noise of the engines. At the rear of the cabin, on the left-hand side, is a large door giving access to the cabin through a compartment immediately behind the latter. The right-hand half of this compartment is fitted as a lavatory. Behind this again is another compartment, separated by a door, for baggage or mail. The full cantilever wing is of standard Fokker design, of wood construction throughout and without any wire bracing. The two main spars are of the box type with laminated chord members and birch plywood webs. The ribs have plywood webs, routed for lightness (except compression members); with solid cap strips. Light plywood, glued and nailed to the framework, is employed for the wing covering. The wings are wired for the installation of navigation lights, and in addition are electrically bonded for wireless purposes. The ailerons are similar in construction to the wings and are of the mitred type, hinged to false spars in the wing. The hinges are on the upper surface of the wing and both the aileron and the wing have flat surfaces on the sides facing the gap between them, so that when the aileron is up there is a definite opening in the lower surface, increasing the drag, and when the aileron is down, the gap is closed, decreasing the drag. Horns are attached to both the upper and lower surfaces of the ailerons and connected to cables running to the cockpit. The tail surfaces are also controlled by cables, carried inside the fuselage, while the stabiliser plane, of semi-cantilever design, is adjustable from the pilots' cockpit. Both elevators and rudder are balanced, and all tail surfaces are constructed of welded steel tubing covered with fabric. They are, in general, built up of large diameter tube forming the main structural member, to which tubular ribs of Warren truss construction are welded; the ribs are braced by another tube bent to conform with the outline of the control surface. A divided type landing gear is employed, with axles and radius rods hinged to the bottom longerons. Vertical struts, fitted with shock absorbers, carry directly the weight of the side engines and the bulk of the wing when the machine is on the ground, so that no weight is borne by the fuselage. The shock absorbers are formed of individual endless rings of elastic cord, which can easily be replaced, and provide a long stroke under load and soft action in taxying. Sauzedde roller-bearing wheels and brakes with 44 x 10 in. tyres are fitted; the track is 15 ft. 8 in. The wing-engine nacelles are mounted outside the vertical landing gear strut, which forms part of the trussing of the engine mount, the latter distributing the load to the forward and rear wing spars by a frame consisting of four longerons of steel tube, welded together and braced by other tubes connecting it to the wing. There are two points of attachment on the front spar and one on the rear spar, while a ring type engine bearer is welded to the front end of this truss, and circular steel tubes welded to the bracing members form the framework for the short duralumin cowling. Span 79 ft. 3 in. OA height 12 ft. 8 in. Wing area 850 sq. ft. Weight per sq. ft. 14-7 lbs. Weight per h.p. 10 lbs. Maximum speed (3 engines) 145 m.p.h. ,, ,, (2 engines) 118 m.p.h. Climb sea level (3 engines) 1,400 ft./ min. ,, (2 engines) 640 ft./min. Climb to 10,000 ft 10 mins. Cruising range 4| hrs. (600 miles). Чрезвычайно надежный самолет Fokker F.10 превосходно подходил для престижных и очень перспективных дальних маршрутов авиакомпании "Pan American" в пределах обеих Америк. На фотографии показан второй такой самолет этой авиакомпании.